There's no doubt that "seven" was lucky last Friday. 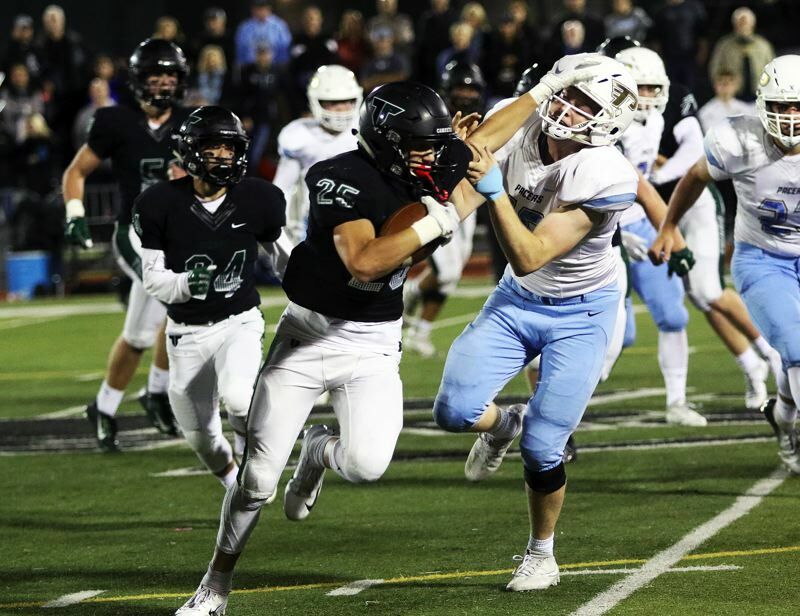 "Seven" — as in Week 7 of the high school football season — was definitely lucky for Lakeridge, Woodburn, West Linn, Banks and Sunset, all of them big winners on Friday night. With all of the night's Week 7 action going on, Pamplin Media Group's sports editors, reporters and photographers were out in force to document a bunch of it. In case you may have missed some of these landmark results, here's a look back at the top five games from Friday. To see the complete stories, just click on the blue hyperlinks below. You can see all our coverage by clicking on the Prep Football Tab — to see it, just hover over the Sports tab — on all our websites. To see all of last week's scores, click here, then click on the appropriate date and classification. To see updated league and season standings for all the state's teams click here, then click on the appropriate classification. To see this week's Play of the Day compilation, click here. Plain and simple, the Pacers felt like they had something to prove. The Woodburn Bulldogs did just enough to win Thursday night as they edged the Crook County Cowboys 14-12 in Special District 2 football action. "I'd rather win ugly than lose pretty," Woodburn head coach Nick Federico told his team following the game. "It was a tough one tonight," Crook County head coach Ryan Cochran said. "I was proud of our kids. They battled really hard tonight. It just didn't come up when it counted in some big times." After last week's painful loss to Lake Oswego, the West Linn football team was ready to turn over a new leaf, turn up the power and turn the corner. And the Lions did just that by turning over previously unbeaten Tualatin. West Linn forced five Timberwolf turnovers in their Friday home game, turned those miscues into 14 points and ran away to beat Tualatin 45-20 at West Linn High School. Sports can often surprise you. In a game between two teams known for their offense, who were each averaging nearly 42 points per game, it was the defense that decided this one, and thankfully for Banks fans, they were the dominating force. The No. 2-ranked Braves toppled the top-ranked Seaside Seagulls, 10-7, Oct. 12, at Broadway Field in Seaside. The offense hummed, the defense hammered and special teams made high-priority plays when the time called for it. In front of a big Beaverton homecoming crowd hoping to see their Beavers build on a three-game win streak, Sunset's ferocious three-headed, three-pronged approach spoiled the festivities before the king and queen could even be announced at halftime. Led by their increasingly confident quarterback Callum Craig and a mingy defense that's starting to get its just due, Sunset scored 30 unanswered points in the first half and never looked back, wheeling to a 54-21 road win at Beaverton High School on Friday night.